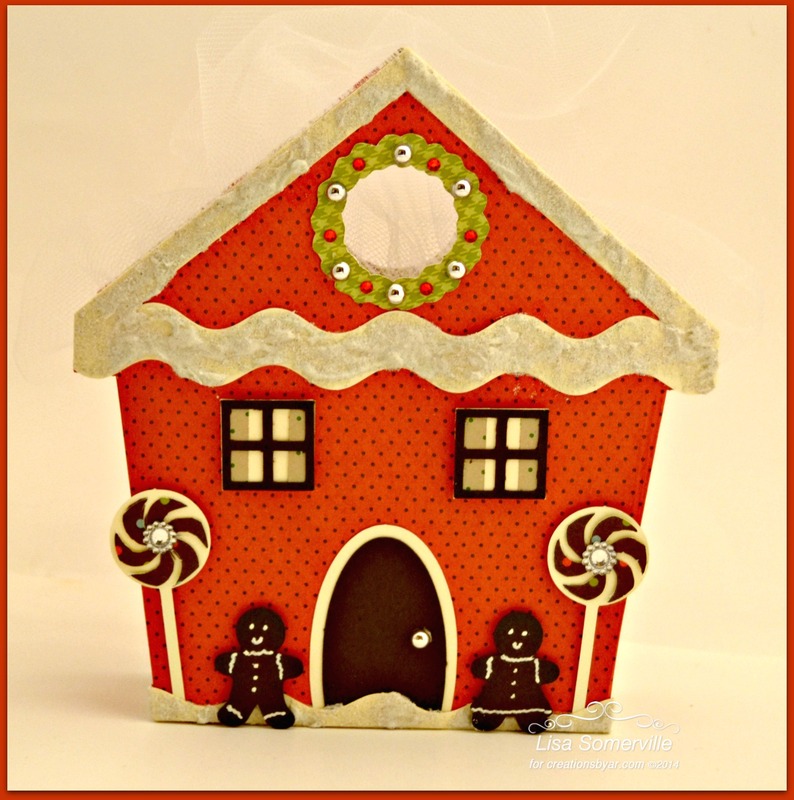 Welcome to the Creations by AR Design Team Christmas in September Blog Hop! This month the Creations by AR Team members are sharing creations made with the new Gingerbread Gift Bag, Starry Tree and Stack a Snowman templates. These three new templates are sold separately, or you can purchase the 2014 Winter Bundle which includes all three templates for $12 (a savings of $3 if bought separately). Creations by AR templates are available for use with Electronic Cutting Machines and also as PDF's for those who do not yet own machines. Continue reading below to see how you can win one of these new templates! I used the Silhouette Cameo to cut the template pieces for my projects. 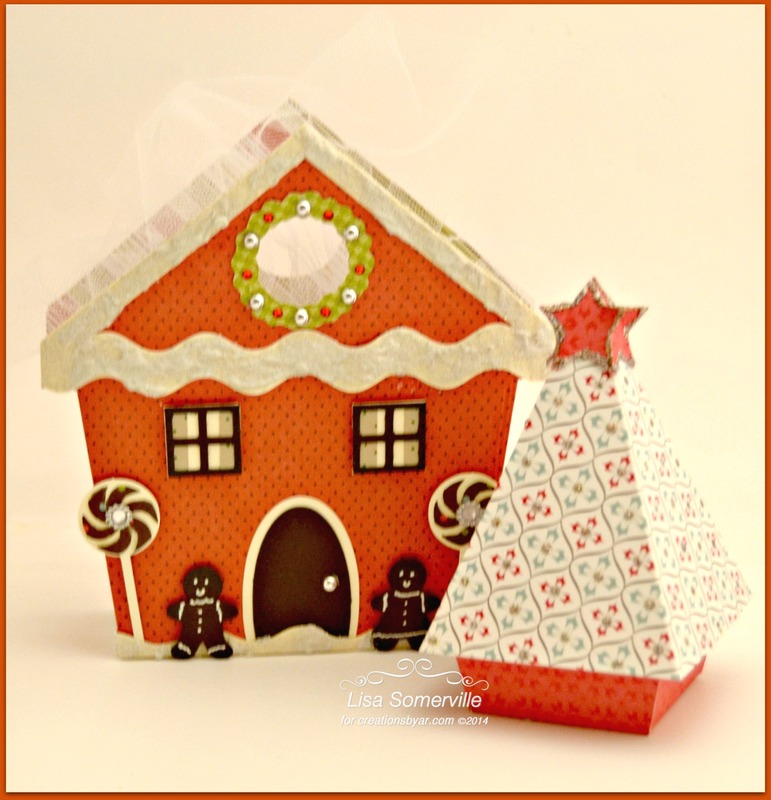 To embellish the Gingerbread House, I added Zva Creative Gems to the door, lollipop centers and wreath, and curtains to the windows. I used DecoArt Texture Sand Paste along with "fine glitter" to add snow to the roof and snow hills. To embellish the tree from the Starry Tree Kit, I added stickles to the points of the star and the centers of the pattern of the tree panel. To participate and be eligible to win, simply leave a comment on each designers blog hop post and/or the Creations by AR Facebook Page by September 12, 2014, NOON EDT. This month there will be three random winners, be sure to leave comments on all of the DT members Blogs and the AR Facebook page to increase your chances of winning! The random winners will be announced on September 13, 2014, on the Creations by Facebook Page and Adela's Blog. Adela * Julia * Doris * Lori * Lyn * Lisa E. * Monica * Patti J. * Tina * Lisa S. * Sue K.
Very cute. I love the detail on the house gift bag. I hope I can win one. Great job, love the detail and love the texture paste look! Adorable. Love that snow texture you got here. Nice job. I love seeing all these variations. Ginger bread house is my favorite. I love the paper you used. Love your snow on the house and the papers you used! Checking all the blogs shows so many variations. Lovely box, I like the paper you used!! Your gingerbread house look so yummy, love it. I really like the coordinating projects Lisa! Cute, cute, cute! Love how your tree and bag coordinate. Is that really orange, or is my monitor playing tricks on me? Inspiration for a haunted gingerbread house when I get the template. Thanks! Sweet projects! I love your color and paper choices! That tree template is fabulous! Great details on the Gingerbread gift bag!